As I have told you so many times that I have no fingers in my hands to tell them, the universe is a living being where, all its parts, have their cycles. That is to say, the elements that contain this universe, have life cycles since they are elementary particles, until they are again since, as always, we must see the universal principle that energy is neither created nor destroyed, alone Is transformed and, therefore, the same can be seen of the mass. Yes friends, the end of a star depends on the size and, above all, on the mass of it and this is the one that, by physical causes and, primarily, the greatest physical cause of which no one can escape in this universe for good Or for bad, gravity, will indicate its end. There is a type of stars that their mass is considered “elevated” (elevated with respect to a norm, our Sun) of from 10 solar masses whose end or step before the end is to become a supernova. What is a supernova? It’s very simple. If we imagine a star as a wood-burning fireplace, we will see that in the chimney we will have fire as long as there is fuel (already, and oxygen, do not be me tiquismiquis). In the formation of stars, the most common element that exists in the universe and which is the basis of everything is hydrogen, an atom nothing heavy, the first of the periodic table, and the most abundant because simple. So the stars, by gravity, have been picking up hydrogen in the form of gas around them, and in the center, where there is a lot of gravity and pressure, through fusion, has taken two hydrogen atoms, squeezing squeezing, ha Turned into helium (spitting in step, apart from a lot of energy, a neutrino and an anti electron, incidentally in addition to photons and therefore, a lot of light and heat … but that’s another story). This beautiful process that takes place in the oven of the sun, in the chimney of the sun is perfect. The problem, as in a wood-burning fireplace, is when the firewood runs out. We can see, when it burns that the wood collapses, that is to say, that the internal structure of the wood does not support the weight of the exterior and the wood is part. Something similar (and caught by the hair) happens to the stars. There is a time when hydrogen is lacking and the pressure and gravity of the center is unable to do something with helium (which does, converts helium into other heavy materials such as oxygen, carbon …) and as the center of The star does not have as much mass is unable to attract the outer parts of the star. That is, it does not have a strong core with great mass that attracts the entire star and keeps it stable. What happens then?. Man, photons that “pull out”, energy that radiates and not enough gravity to keep everything together … the outermost part of the star, chromosphere and crown (which we see), escape from the star. This happens so suddenly or not, depending on the mass of the star, which is like an explosion and, from outside, it is said that the star has become supernova. When the process is slow and the layers are “marching” little by little, it seems that the star grows and is said to become a red giant, where the reddish color is mainly by materials and the wavelength of energy Which radiates. In the end, whether slow or fast, there is no gravity in the core enough to hold it all together and the star does “pop” (explode), expelling its outermost layers. At the same time, in which the outer layers are lost, the star collapses. That is, the inner part, which does not have to hold anything and, depending on the mass of the star and the materials in the core (center) becomes smaller, colpase, having a nucleus not hydrogen (there are ) And if more than helium. This new star, aided by the gravity of heavier materials, is usually denser than the original, like the embers of our chimney … but this is another great story. In the end, a supernova is only an intermediate state in the life of certain stars of a certain size so, how do we know the size to know what happens to that?. For this an Indian scientist named Subrahmanyan Chandrasekhar calculated what is called the boundary of Chandrasekhar. This limit indicates how much mass the star has to have to become a black hole or a neutron star, that is, a star that will become a supernova at some point in its life. How do I calculate Subrahmanyan Chandrasekhar the limit? Well it’s a very curious and funny question. As I have indicated a star, the one held together is a tug of war between gravity and the energy it emits. Calculating the energy through its disintegration we can know the mass if we take that the star is formed by hydrogen that is necessary so that the system stays stable. If the mass is greater, bingo!. Subrahmanyan Chandrasekhar calculated that 1.5 times the mass of the Sun would be enough. So our star, when you start running out of fuel, will suffer a process of becoming a red giant very slowly, so much, that will be many thousands of years before becoming a white dwarf and continue this way billions Of years until it evaporates leaving a cloud of heavy materials. 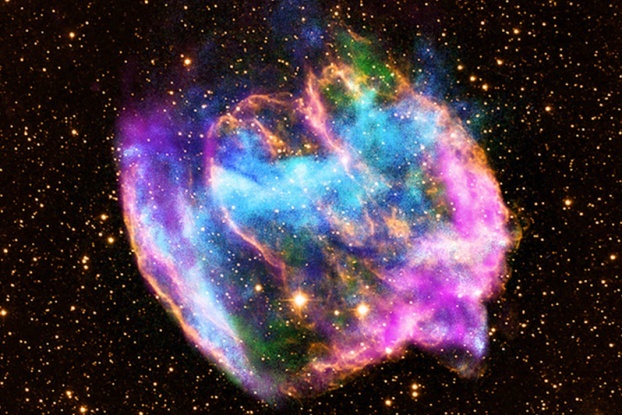 That is, it is not going to convert or it will explode like a supernova but it will be consuming slowly and the loss of the outer layers will not be as “explosive” as a supernova.